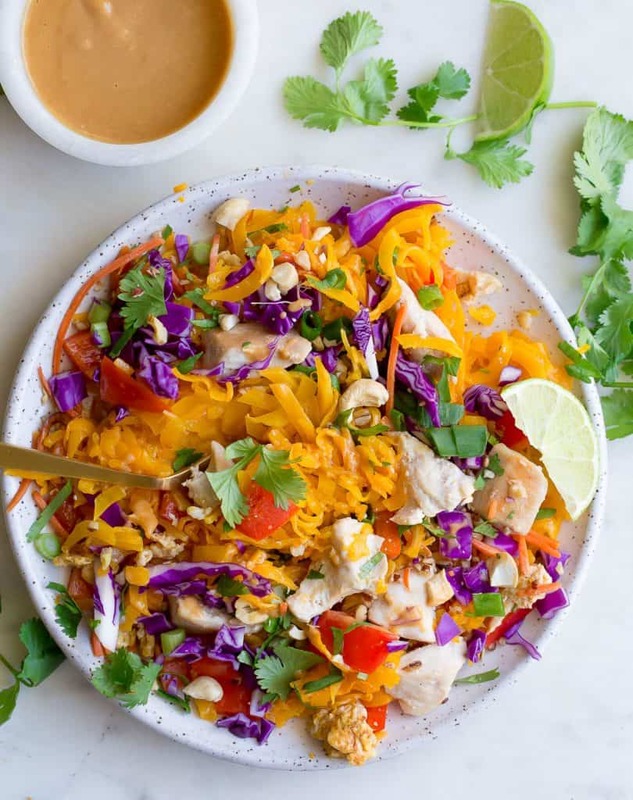 Paleo Chicken Pad Thai combines butternut squash noodles, tons of vegetables for texture and flavor, and is drizzled with the most delicious creamy lime almond butter sauce! This kid-friendly variation is not spicy, but full of flavor. 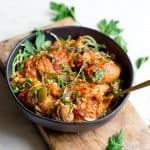 You’ll love this for an easy and healthy weeknight dinner! I am now obsessed with butternut squash noodles. They have this creamy nutty texture that is WAY better than pasta noodles. So how many times did I make them this week? Oh I’m glad you asked! Just 4 times. And this week, I have them on my list to make at least 5 more. I’m getting a bit off topic. 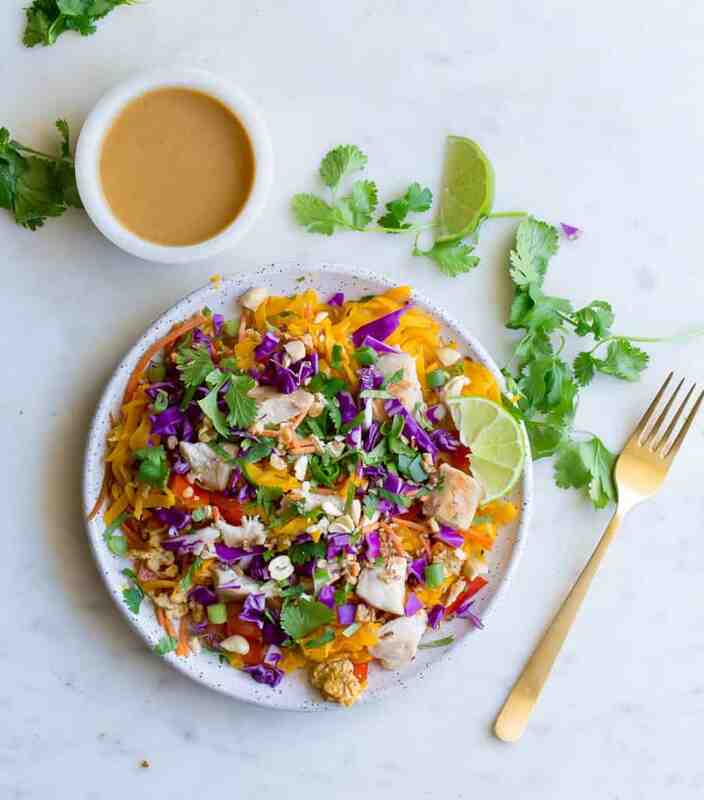 Paleo Chicken Pad Thai was born after my kids demanded what they call “peanut butter pasta” for dinner. 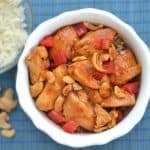 It has the most delicious Thai peanut sauce and is served over pasta with chicken and vegetables. Since we never seem to have peanut butter in the house anymore, I made an almond butter sauce. I changed it up a bit from my normal sauce, adding in some lime and making it creamy with some flax milk (any dairy free milk will work). And the result from my official taste testers? AWESOMESAUCE!!! Their word, not mine. I was able to get them to try some butternut squash noodles with a mixture of regular pasta. I also changed up the vegetables a bit and added in some purple cabbage. Just because the purple was so pretty. To make things really easy, I baked the chicken and the noodles on the same pan while I made the sauce. Saving time and dishes, to make this dinner ready in less than 30 minutes! You can also choose the stovetop version, either way you WIN! Add in that extra crunch with chopped almonds or cashews. You may have more sauce than you need, but you can reserve for another day, or as a dipping sauce with vegetables. Begin by heating your oven to 375 degrees. Line a baking sheet with foil and set aside. To use the stovetop variation, see the notes section below. Salt and pepper your chicken breasts (make sure they are roughly around the same size for even cooking). Place on the baking sheet. Now prepare your butternut squash. Remove the bulbous end of the squash (you can't spiralize this end because of the seeds). Now peel the skin off the narrow end that you are going to spiralize. It's easier to cut this part in half. Spiralize the sized/shape noodles you like. (note that thicker noodles require at least 20-25 minutes, thinner noodles might be done faster). Once noodles are made, drizzle with a tbsp of oil, add to the sheet pan. Salt and pepper both the chicken and the noodles. Place in the oven and bake for 20-25 minutes, or until chicken is cooked all the way. Meanwhile make the sauce: in a blender or food processor, pulse together almond butter, honey, sesame oil, coconut aminos, garlic, lime, vinegar, and ginger. While motor is running, pour in cashew milk. Continue to pulse until sauce is creamy and well combined. Heat up skillet to medium heat. Spray with non-stick or use avocado oil. Saute carrots and bell pepper for 2-3 minutes. Whisk together eggs, and add them to the pan. Continue to cook another 2-3 minutes or until eggs are scrambled. Set aside. 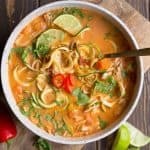 Remove chicken and butternut squash noodles from the oven. 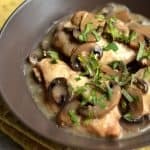 Cut chicken into small pieces. 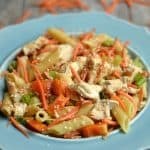 Toss chicken and noodles into a large bowl. Now add in eggs and carrot/pepper mixture. Add in cabbage, cilantro, and cashews or almonds. Continue to toss and pour the sauce on top of the mixture (you may not want to use the entire sauce). Mix around until well combine. Season with salt and pepper to taste. Serve! *Chicken breast tenders are preferred since they will cook evenly. 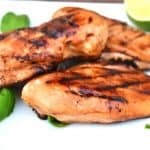 If you have just chicken breast, cut them into even strips. **To make on the stovetop, saute the butternut noodles first with avocado or olive oil for 5-7 minutes. Remove from pan and keep warm. Next, cook the chicken after cutting into bite sized pieces. Once chicken is almost cooked, add the egg. You had me with those stunning colours! Honestly I don’t know who would want to eat beige boring pasta when they can have this! Gorgeous! I agree Donna!!! Love some bright colored vegetables in place of pasta! I love squash noodles! And that sauce sounds amazing – I can’t have peanuts anymore so I can’t wait to try this! Thank you! So pretty with the red cabbage and all of the other vibrant colors! Looks like an absolutely perfect weekday dinner! Oh my goodness I wish I had this right now! It looks so good! Pad Thai was my favorite before my gluten-free days. I’m going to have to make this soon. Thanks Emily, hope you enjoy it!! I love that you used butternut squash noodles for this recipe. So pretty with all the colors! Rainbow Pad Thai! This is stunning! I LOVE Paleo Thai food ! This chicken pad thai looks so gorgeous and delicious. A must try ! I need this meal in my life soon! 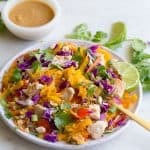 Pad Thai and butternut noodles are 2 of my ultimate weaknesses, so I can’t wait to try them paired together! The photography on this is just stunning – look at all of those beautiful colours! It’s so funny when people say Paleo is restrictive because food like this exists! 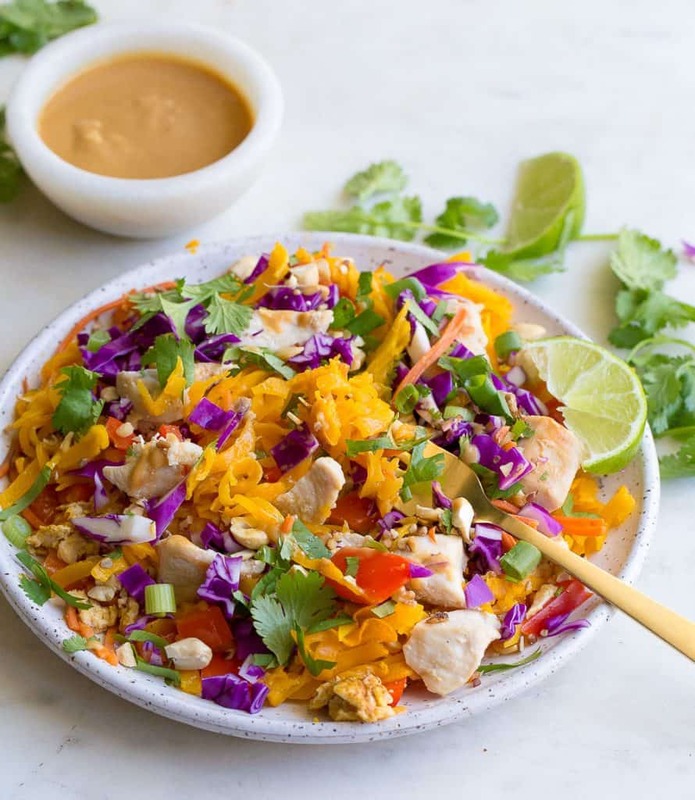 I LOVE Pad Thai and this version looks like one I need to add to my menu, stat! This will be perfect for the Thai cravings I get multiple times each week. And I LOVE squash noodles! Amy, I had to write you and tell you that I made this for my family for dinner tonight. It was seriously, SERIOUSLY one of the most delicious things I had ever made, Thank you so much! The flavor was really good and I would make this again. Gave 4 stars because: 1) It took me 45-50 minutes to make, and I had pre-spiralized squash and pre-cut cabbage; and 2) for my tastes, it needed salt and extra lime on top of individual serving; and 3) by the time I put everything together it was luke warm. I would put it all in the pan together when adding the sauce. I would definitely double the recipe next time so could have left-overs. My husband and I ate the whole thing! P.S. Don’t rate a recipe that you haven’t actually made. This dish looks fabulous. I love the blend of colors, flavors and textures that this dish promises. Can’t wait to try it. I made the recipe exactly as listed and it was great. The second time I used spaghetti squash and added some chili paste and it was awesome too. Thanks for the great recipe. Flavors were really great, but the dish came out like a clump and grainy. I was concerned when the directions said to cook the spiral cut butternut squash in the oven. Being so thin I expected the squash to cook quickly and it did. This lead to the dish getting mushy once all mixed together. I’ll make this again, but cook the squash separately in a frying pan. Thanks! I just searched for sheet pan pad Thai and this came up. Have to say it looks DELICIOUS and I’m definitely going to try it out! Thanks!! 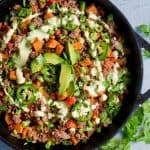 I tried this recipe, and it was awesome! The sauce was amazing. Thank you!